Hi everyone! A short post today, since I'm still not feeling very well. A little while ago I showed you a beautiful green from Catrice, Run, Forest, Run! (LOVE the name and movie by the way). 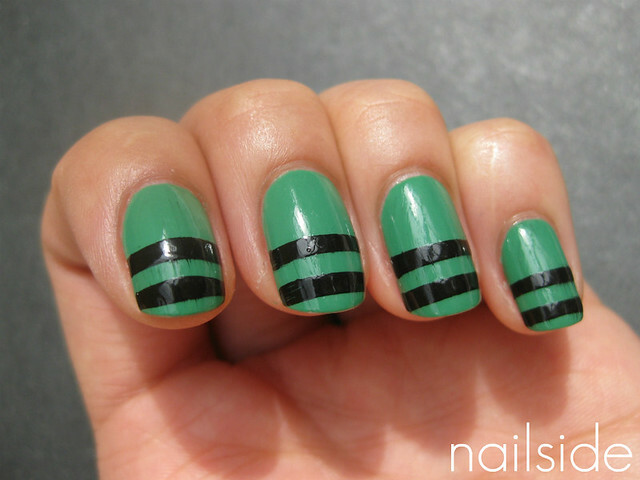 Today you can see how I upgraded the mani to a sporty French with a simple stripe design. The look instantly reminded me of sportswear, hence the name. The black polish I used for the stripes is Color Club Where's The Soiree?. This is really awesome! Mind if I try this? And maybe funk it up some more? Wow! It looks great-and does remind me of sports! ohh i do like this!! & it remindes me of sportswear as well!